Note: There are few things actually implemented in some way in the official IDE, like the installation because this mod originally comes from Aug 2012. Couple of clicks and ready! Prepares your system for the boards. Tested in Windows 8. 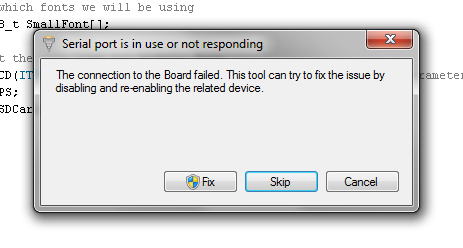 When uploading a sketch, if port does not respond the IDE will try to fix the issues instead of showing you the "port already in use message", no reboot, no physical unplug/replug, finding the app using the port. Lots of Sketches? lots of Libraries? lots of Examples?, No problems at all. No more blurry/ugly icons For Windows 7/8 taskbar. Produced by some BT dongles (More information: http://www.arduino.cc/cgi-bin/yabb2/YaBB.pl?num=1237179908). 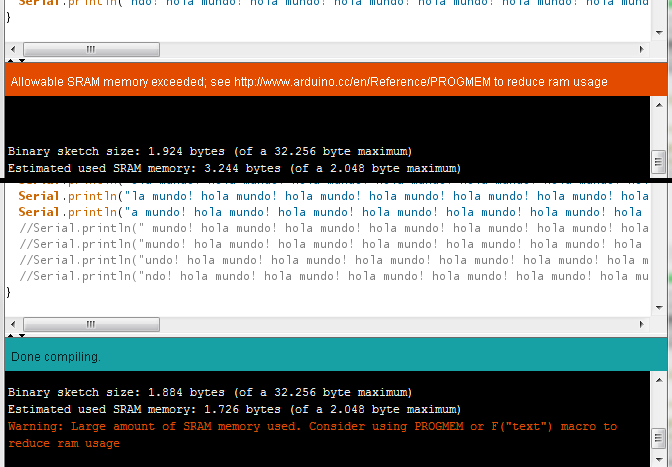 Does not mess with other Arduino IDE versions and preferences (not even with official 1.0.1). You can go to Preferences and set another Sketch directory to keep your User librararies and sketches appart. Also the font is customizable easily. * Hold Control key on Upload: To open the Serial Monitor automatically when upload complete (do not lose a bit! from the Serial data or compulsivelly click the serial monitor button). Not an improvement but as a normal windows app, includes an easy way to remove it and the setup including java and everything you need is about 35 mb. * 1.0.5 20130524: Horizontal scroll is working properly now. * 1.0.5 20130523: Updated to official 1.0.5 version. Some fixes in the Import library function. New option to avoid placing the cursor on the Setup function when opening a sketch. 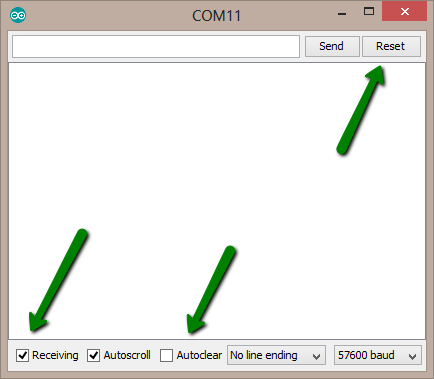 * 1.0.4 20130331: avrdude wrapper now adds line breaks to the received messages. * 1.0.4 20130330: Reset button in Serial Monitor. Adding atmega328 to avrdude.conf. Auto format now removes extra spaces. * 1.0.4 20130314: Updated to official 1.0.4 version. 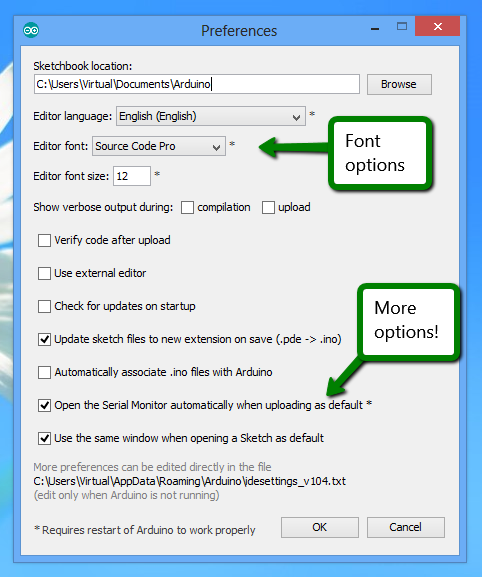 New options in preferences to reuse always the current window and open the serial monitor as default. 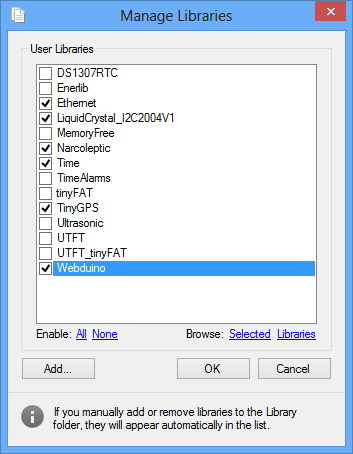 Driver installer updated. Font now is Source Code Pro due licensing of the old font. PATH is not modified anymore (uninstall previous version is recommended). Replace All button does not hang the interface anymore. Tab switching fixed. Control-C without selection now selects the whole line. Control-X at the end of the Sketch does not throws exceptions anymore. AvrDude.exe updated. Minor changes to the template Sketch to use the default Bare minimum sketch. * 1.0.3 20130203: Key shortcut to upload and open the serial monitor is now Ctrl+M. * 1.0.3 20130202: Tweaks for Windows 8 in the driver installer. Key shortcut to upload and open the serial monitor is now Ctrl+i to avoid issues with some locates. Returns the maximum items that fit in the current screen for the menu scroller now uses Paul Stoffregen code. That ensures the hex files are always on the same place so you do not need to mess with copying build paths into the programmer (if somebody uses an external programmer). 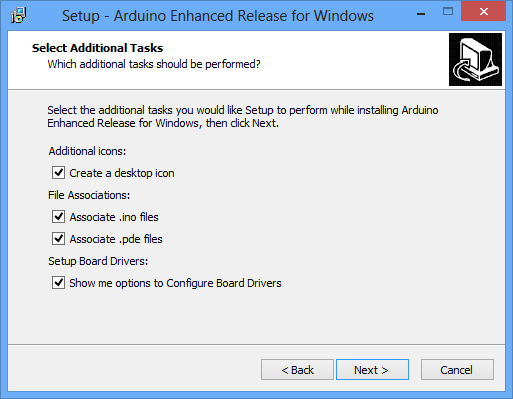 Inclusion in the setup - it is up to you..
PS: maybe you have to place your [MOD] topic into "Using Arduino: Installation and Troubleshooting" forum item.. I thought about using a more older framework to avoid users to need .net 4 (version 4 has more than 2 years already btw), but I found that some stuff I was using like the x64 detection to install the drivers with ease was only available in "hacky"/ugly ways in older versions, so at the end I decided to set 4 for cleanliness. How about letting the user choose where the libraries folder is (like the user can with the sketch book)? 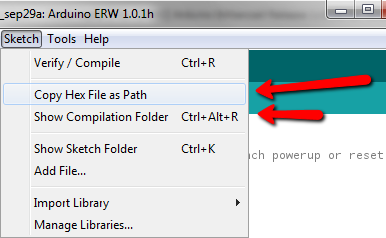 It is doable, but since the preferences in this version are not shared with other arduino ides and the sketch folder can contain the libraries I don't think it is too useful, what do you think? I hadn't realized that I could place my custom libraries in the sketch book. Thanks for the info, and because of that, I agree that it is unnecessary. 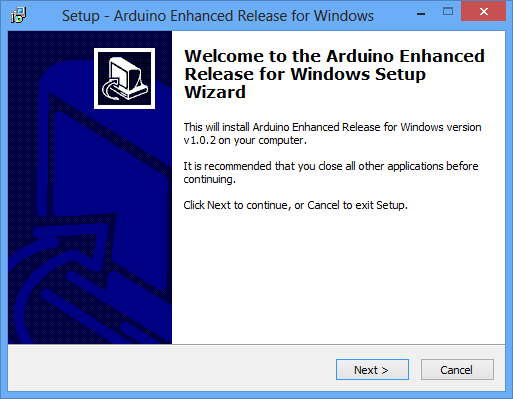 Hello, this is a tweaked Arduino IDE 1.0.1, hope you enjoy it! Can you provide a little summary of the enhanced functions ? Screen captures are not so explicit for me. Hi, which one for example? Sorry I misunderstand the title of the post. No news in the IDE itself. 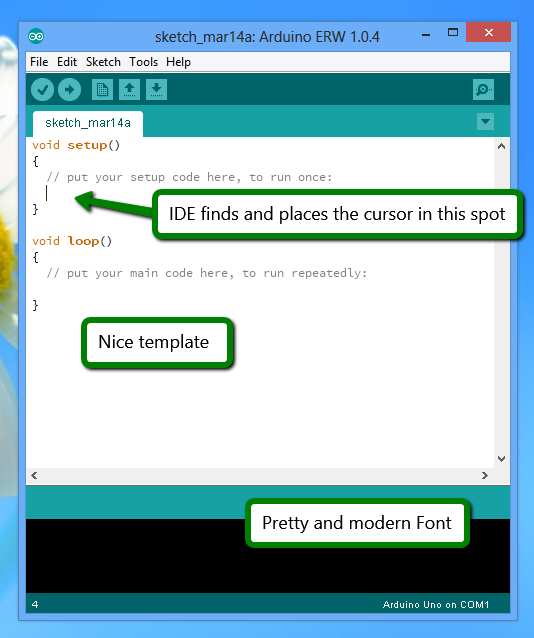 There are some hacks in the IDE but they are little, and the snapshots reflects them, like the icon, template. Fantastic work! I received a free license for the cross-platform installer from the guys of Bitrock, specifically for the purpose of making a multi platform installer for Arduino. If you want to use it, I could forward it to you.